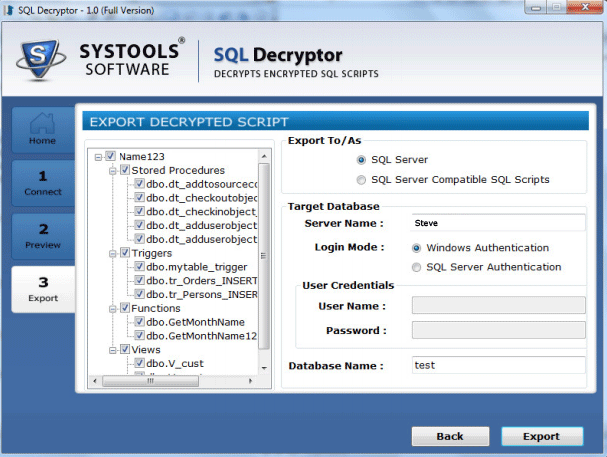 SQL server decryptor is an automated solution for decrypting SQL stored procedures, views, triggers, and user-defined functions. This SQL database Decrypt Tool is compatible with almost all versions of the SQL server i.e., 2014, 2012, and below. One will be able to save time and money, which would be spent on restoring lost initial code for encrypting the SQL objects. A private key gets generated when database gets encrypted. If the object decryption key is unavailable then, SQL decryptor is one of the best solution to decrypt SQL database because one just have to provide the server and database name with authentication for decryption. Users can choose any one of them and authenticate their server credentials with help of any technique. After decrypting entire SQL database file, software loads the data within its preview panel. Different SQL server attributes like stored procedure, triggers, and functions could be previewed in the software panel before they are saved directly to SQL server or in its compatible scripts. The SQL decryptor is designed in such a way that it provides options to extract and save the decrypted data with or without encryption. Users can save either data directly in the SQL server or in SQL server compatible script. Valid SQL server credentials will be required to move decrypted data in the server. Q. 1. Will your software save the server credentials when we are mentioning them for proceedings with SQL decryptor? No, the product is not having provision of saving data in any kind of secretive database. Your data will be totally safe and secure from any type of related risk. Q. 2. 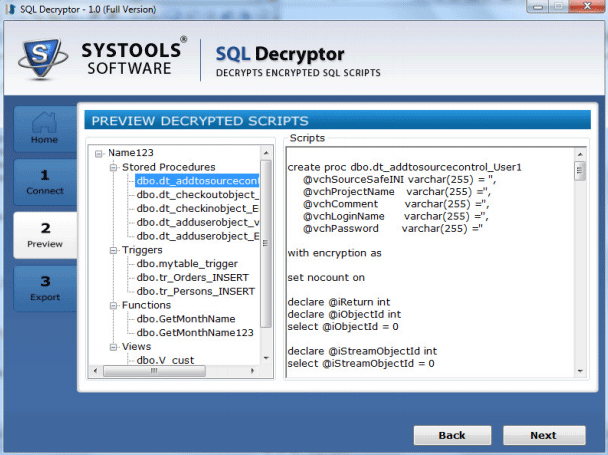 Does your SQL decryptor software provides a feature of exporting selective data? Yes, our sql database decrypt Tool is designed in such a way that it renders users to perform selective exporting of data items within just few couple of clicks. Q. 3. Is your software compatible with encrypted SQL database file of SQL 2005? 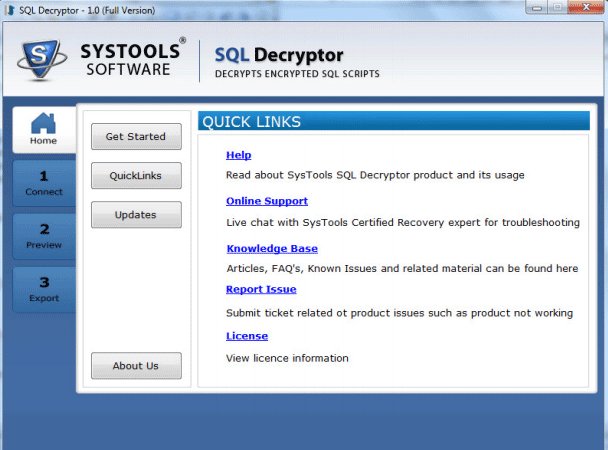 Yes, SQL decryptor is designed with SQL database file compatibility of all its versions i.e., 2014, 2012, and below. Q. 4. 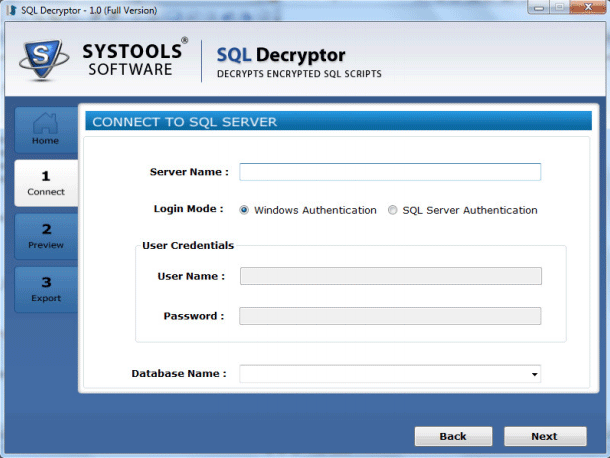 Is it mandatory to have SQL server environment on machine for this SQL server decryptor? Yes, it is mandatory to have the SQL server environment on our machine for experiencing a smooth working of our sql database decrypt software. 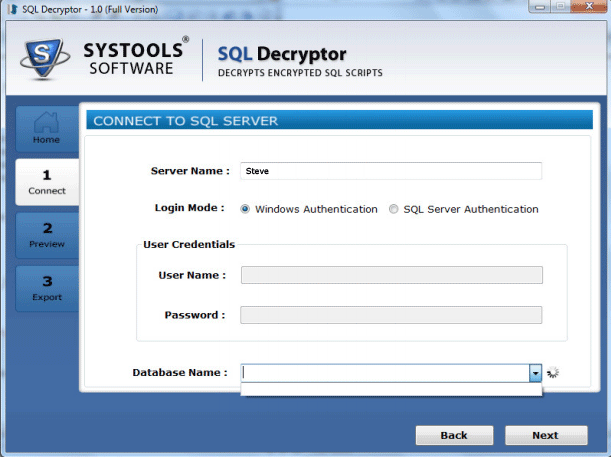 How to Decrypt Encrypted SQL Server Database Files With Tool? Till today’s date, your sql database decrypt products had always been excellent in every technical aspect. Well when it comes to SQL decryptor, the same view comes in mind. I have used this application to decrypt SQL database file, which was encrypted long before 5 to 6 months. It is so much an easy task for me to do the same just because of your application. Thank you for providing such products! Once I decided to use freeware version of SQL database decrypt, it was so effective and easy-to-use that I was ready to spent my dollars in it to purchase. I was not having any of the SQL server version on my machine but still I was able to store decrypted data with help of SQL server compatible script option.